After a somewhat surprising defeat to Wales in the last round ended England's Six Nations Grand Slam hopes, Eddie Jones has made notable changes to his lineup to face Italy on Saturday at Twickenham. The midfield pairing of Manu Tuilagi and Henry Slade that worked so successfully as England stunned defending champion Ireland and France in the opening rounds has been broken up. Ben Te'o returns to the starting XV at inside center, with Tuilagi shifting outside of him to form an extremely physical combination. "It's always been something we wanted to have a look at and have another option," Jones says. "We've been really happy with Sladey, but it just gives us another way of playing." The physicality of England's backline is further enhanced by the inclusion of winger Joe Cokanasiga, who makes his first Six Nations start after impressing with tries against Australia and Japan in November. 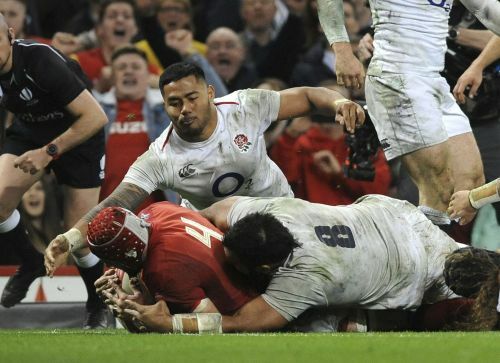 Such has been the unpredictable nature of Jones' decision-making since he took charge in 2015, it remains unclear if the lineup was one he has been waiting to unleash, or whether it was triggered by England's listless second-half showing in Cardiff two weeks ago. "This is probably the team Eddie has wanted to pick for quite a while," Italy coach Conor O'Shea says. "It's the one that he's probably dreaming of." While Wales is the only unbeaten team going into the penultimate round of fixtures, England's bonus-point victories over Ireland and France leave it well positioned to take advantage of any slipup by the leader. Despite having comfortably scored the most points in the tournament, England's reliance on a kicking-based game has seen it carry the ball less distance on the ground than the likes of Wales and Ireland. However, the drafting of power into the backline isn't designed to change that. "As far as I know about rugby it's about scoring tries, not about making meters," Jones says. "When we get bonus points for making meters we'll start worrying about it." With Italy's Six Nations losing run having stretched to 20 games when it was defeated by Ireland in the last round, O'Shea isn't too interested in the numbers either. "We know the stats," O'Shea says. "We know a lot of rubbish that can be trotted out, but we know where we're progressing and how we're getting better." Italy has shown encouraging signs in relatively narrow defeats — at least compared to recent seasons — to Wales and Ireland in Rome, and is boosted by the return of captain Sergio Parisse and Sebastian Negri to the back row in hope of beating England for the first time. Two years ago on its last visit to Twickenham, Italy bamboozled England by implementing the innovative tactic of not competing at the ruck. Italy held a two-point lead with 20 minutes remaining, before fatigue saw it fall away late. O'Shea says that was a tactic born of necessity, due to Italy's inability to match England's fitness at the time. Jones has promised his side will be ready for anything. "If Conor lets them play rugby," he says, "they can play some good rugby." England: Elliot Daly, Joe Cokanasiga, Manu Tuilagi, Ben Te'o, Jonny May, Owen Farrell (captain), Ben Youngs; Billy Vunipola, Tom Curry, Brad Shields, George Kruis, Joe Launchbury, Kyle Sinckler, Jamie George, Ellis Genge. Reserves: Luke Cowan-Dickie, Ben Moon, Dan Cole, Nathan Hughes, Mark Wilson, Dan Robson, George Ford, Henry Slade. Italy: Jayden Hayward, Edoardo Padovani, Luca Morisi, Michele Campagnaro, Angelo Esposito, Tommaso Allan, Tito Tebaldi; Sergio Parisse (captain), Abraham Steyn, Sebastian Negri, Dean Budd, Federico Ruzza, Simone Ferrari, Luca Bigi, Andrea Lovotti. Reserves: Leonardo Ghiraldini, Cherif Traore, Tiziano Pasquali, David Sisi, Jake Polledri, Guglielmo Palazzani, Ian McKinley, Tommaso Castello.